V 's exceptional production values including top-of-the-line visual effects that rival the technology on display in Hollywood blockbusters immediately create a sense of credibility, urgency and spellbinding wonder to what was arguably ABC's best 2009 science fiction pilot following the launch of their criminally underrated FlashForward . A reinvention of 1983's miniseries developed by Kenneth Johnson and inspired by Sinclair Lewis' fascism in America cautionary tale It Can't Happen Here , Warner Brothers' revamped V is at its best when it ramps up the action and mystery such as in its jaw-dropping debut wherein within minutes, large alien spaceships hover over more than two dozen of the world's most powerful cities. On the flipside however, because V incorporates some ill-timed, politically potent messages seemingly aimed at the Obama presidential agenda of universal healthcare and alternative energy sources, it's at its worst when the obvious commentary on our post 9/11 society is preached to us rather than subtly laced into V 's otherwise admirably complex narrative thread. Nonetheless, as evidenced in this incredibly addictive twelve-episode first season spread across three DVDs, V mainly wows us as an ingenious, twist-filled paranoid thriller that knows its The 4400 , Buffy , Angel , X-Files, Fringe etc. predecessors well and strives to ace their similar formula. And thankfully, it’s been picked up for a second season which should give those working behind the scenes more room to breathe as we sense that despite garnering the most male viewers aged 18-49 of any new series last year, V is still finding its rhythm. 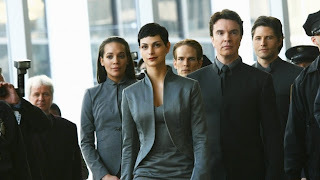 Namely, as we watch FBI counter-terrorism agent Erica Evans (Elizabeth Mitchell) band together with others who’ve seen through the beautiful, benevolent façade of the alien visitors for the true threat they pose, V suffers from soap-opera “tell us,” rather than “show us” syndrome. Thus, information is repeated multiple times within a single episode while characters make a plan, recruit help, carry it out and rehash it again. 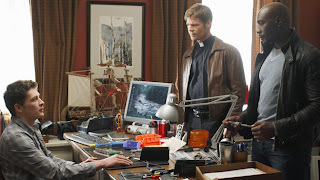 However, the late-season echoes in plotting are easily forgiven by the fact that overall, V is bolstered by a capable cast and against-type characters such as Joel Gretsch’s brave renegade battle scarred priest Father Jack Landry who joins Erica’s team of rebels along to fight the supermodel stunning yet sinister Visitor Queen Anna (Morena Baccarin). Additionally, in providing us with enough diverse subplots to fascinate and disturb as one-by-one our first impressions of certain individuals are proven false with masterful reveals as the opening cycle of twelve episodes careens to a startling cliffhanger, V gets off to an impressive and promising start in its primary season.